Well over thirty percent of the visitors to the Israel Museum in Jerusalem in August were dati leumi (religious Zionist) families. What does this tell us about where the dati leumi community is currently at, and where it is going? The current Israel museum presents a cultural challenge to a national religious way of life. The artistic philosophy determining the choice and the presentation of the exhibits is definitely post modern, post Zionistic, universalistic and relativistic in its socio-cultural values. Jewish religious and ethnic art, and Zionist Israeli art, are presented on an equal social-value footing with the most radical examples of anarchistic, self centered exploration and artistic expression. Similarly, the hall of Israeli archeology presents the first and second Temple, and mishnaic periods, simply as one of many dominating cultures that 'came and left' their imprint on the land between the Mediterranean and the Jordan River. And, of course, in roughly ten percent of the exhibitions there are distinct problems of non-modest body exposure. The museum's directorship makes no effort to promote or encourage a Jewish (either religious or ethnic heritage wise) perspective on teaching artistic expression. For all of these reasons, ultra-orthodox rabbinic leadership does not encourage visiting the museum, and the more conservative dati leumi rabbis do not promote the educational importance of enjoying and learning form the museum's exhibitions. And yet, we, the dati leumi community, came this August to the Israel Museum in droves. Why? There were certain pragmatic reasons. Percentage wise, we prefer to vacation in Israel, while the secular community prefers to travel abroad. There are a lot of dati leumi families in Jerusalem area close to the museum. Jerusalem is the 'cultural capital' of the dati leumi world. The museum is air conditioned, and children come in for free. There are many activities for children, the long, wide corridors allow the kids to (moderately) 'run around', and most of the exhibits allow each age group to find and take what is appropriate to them. 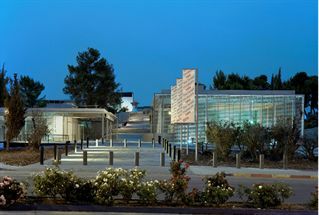 In other words, a dati leumi family, for a little over one hundred shekel, can 'keep the kids busy' and enjoy a 'family outing' together at the Israel Museum in August. But there are deeper and more serious reasons for our 'adoption' of the museum, reasons that show that we are on the right path, and slowly gaining momentum in developing a nationalistic, Torah based way of life that is, and will, have a significant impact on general Israeli society. First, our use of the museum reflects the respect and importance our public ascribes to learning and education. This is the positive result of all of those years of paying very burdensome tuition that covers the high school yeshivot and ulpanot's double program of Torah and secular learning. We have the highest percentage of academic degrees of any Israeli sector. We are staunchly middle class and seek economic security through professional education. Our children hopefully get married 'young' and then start a ten year struggle of balancing marriage, babies, professional education, and making ends meet. Most succeed. And of course, our great value and investment in Torah learning encourage a double edged intellectual curiosity to know about all areas of life. In brief, visiting the museum appeals to our highly developed intellectual drives and openness to the world. On a deeper level, our August massive visits to the Israel Museum is an expression of our growing self confidence in our ability to successfully and creatively integrate an honest, authentic life of Torah with knowledge and involvement in secular society. We tour the museum inwardly believing and hoping that we can integrate Torah social values and those of secular, modern art. The foremost example of our ability to integrate Torah with modernity is the Torah based nationalistic leadership that we are currently putting forth in the army and in national security matters. Compared with ten years ago, the dati lemi community has taken an increased presence in the national media, and has created a range of community oriented magazines and publications. There are a growing number of dati leumi artists in film, poetry, novels and drama, with a wide variety of spiritual-cultural messages. There are a variety of efforts to develop a Torah-Jewish psychology. Dati Leumi academics have taken the leadership in university Jewish studies, and there are an increasing number of halachic-oriented research centers in areas of economics, welfare, agriculture and national security. In my opinion the present generation still mixes too much liberal, secular knowledge/culture, with too little (both in amount and authority) Torah knowledge in creating a particular dati leumi social cultural way of life. But the direction and momentum is positive and blessed. And we will, with G-d's help, succeed. This evolving desire and drive to create a social culture that is both true to the Torah, and relevant to modern, secular society, is the real reason that we are flocking to the Israel Museum this August. Inwardly we are saying "We have to be careful, but we certainly don't have to be afraid of secular art. We are confident that the Torah has the answers, and will serve as our guide, in the questioning path that we are taking through the labyrinth of relativistic, liberal secularity". Rabbi Yosef Veitzin of Psagot, a disciple of Rav Kook, taught me that the Torah of the Exile was a Torah that centered on the life of the individual, and because of the social reality of the Exile, became 'overly' spiritual and self defensive. With the return of Clal Yisrael to Eretz Yisrael, G-d is challenging us, and helping us, to develop a Torah observance that takes place in the context of the life of the Clal in Eretz Yisrael, and will forcefully combine spiritual and materialism in a creative fashion that will advance our Redemption. We are hopefully in the first stage of creating a new way of Torah life in Eretz Yisrael. A visit to the Israel Museum can only enhance and advance, and not hinder, the fulfillment of this holy task.